The CGIAR Research Program on Agriculture for Nutrition and Health (A4NH) is built on the notion that agriculture can do much more than reduce hunger and poverty – it has an enormous potential to significantly improve the nutrition and health of people around the world. With an innovative perspective that focuses on consumption and demand, A4NH seeks to realize the enormous potential of agricultural development to make significant contributions to improving the nutrition and health of people worldwide. Hunger, malnutrition, and poor health are widespread and stubborn development challenges. Agriculture has made remarkable advances, but its contribution to improving the nutrition and health of poor farmers and consumers in developing countries lags behind. CGIAR Research Program on Agriculture for Nutrition and Health (A4NH) begins with consumption – of healthy, affordable, and safe foods – rather than supply, offering an innovative perspective on the relationship between agriculture, nutrition, and health through research that strengthens the knowledge base and new partnerships that lead to real outcomes. 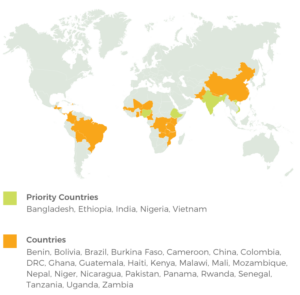 As CGIAR’s only research program on nutrition and health, A4NH operates as a lens, with a particular focus on the system-level outcome of improving food and nutrition security for health. Recognizing the magnitude of the task, A4NH is led by the International Food Policy Research Institute (IFPRI) and managed by a group of four other CGIAR Research Centers and two academic institutions, and brings together the talents and resources of other CGIAR Research Centers plus a wide range of partners, to carry out research activities through five unique, yet complementary, flagship programs and three cross-cutting units in at least 30 countries. By 2022, we expect to be able to demonstrate observable changes, among our partners and in the countries where we work, as a result of A4NH research. 10 percent fewer women of reproductive age who will be consuming less than the adequate number of food groups in Ethiopia, Bangladesh, Vietnam, and Nigeria. 116 million more people, of which 50 percent are women, will be without deficiencies of one or more of the following essential micronutrients: iron, zinc, iodine, vitamin A, folate, and vitamin B12 in at least 14 countries, ten countries in Africa and four in Asia.